These two snags were propping up each other. Bluebirds nested in a cavity this spring. Both trees fell this fall - 2013. 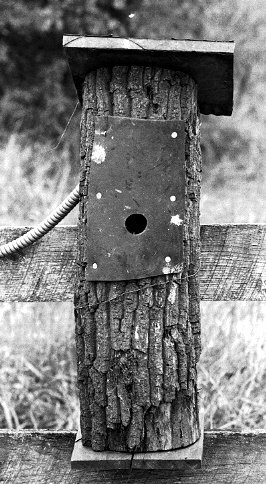 Bluebirds nested in this old fence post at least once before it broke off. 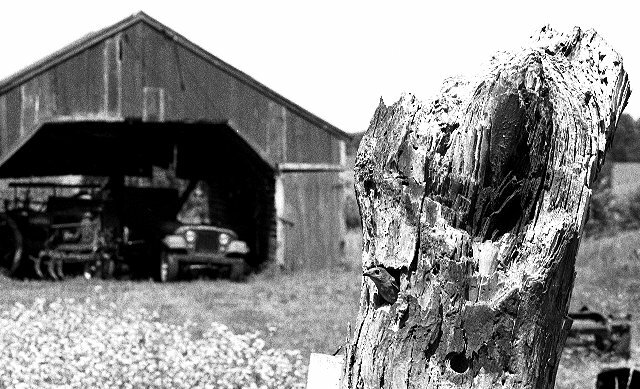 Untreated wood fence posts are a rarity now. Snags don't last long, compared to the living tree. But, they still play an important ecological roll while lying prone on the woodlot floor. Snags are a precious commodity in developed areas and are usually totally lacking in the home habitat. 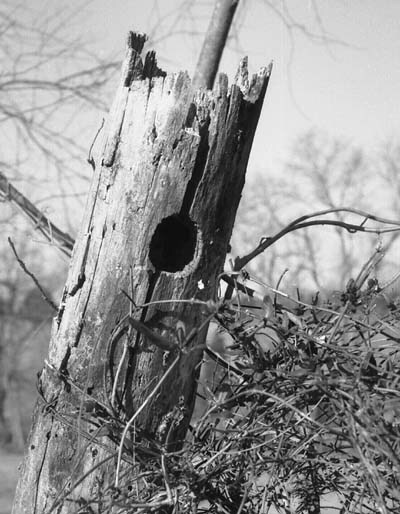 Many species benefit from the presence of snags, but, none more than woodpeckers and the other cavity nesters who use old woodpecker holes. Adding a snag to your yard is well worth the minimal effort. 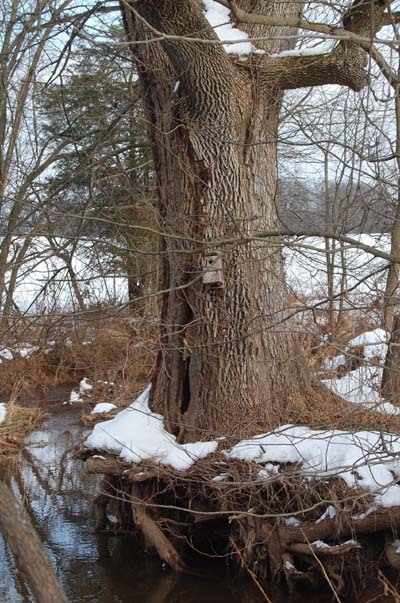 Small snags can readily be found by contacting sellers of firewood or those involved in clearing land for development. Unless you require delivery of the snag, it will probably be free. 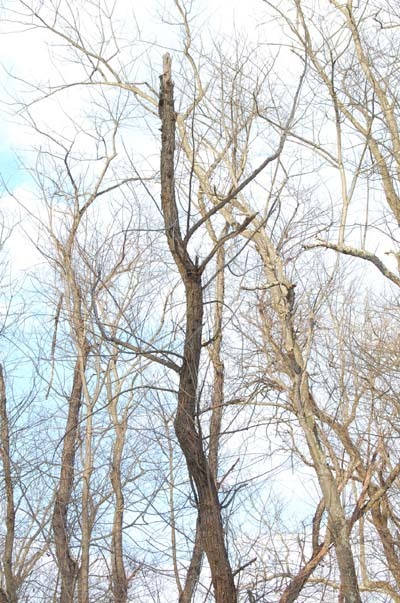 It should be around 7' long to attract woodpeckers. Anything longer would be too heavy to handle unless it were of very small diameter. 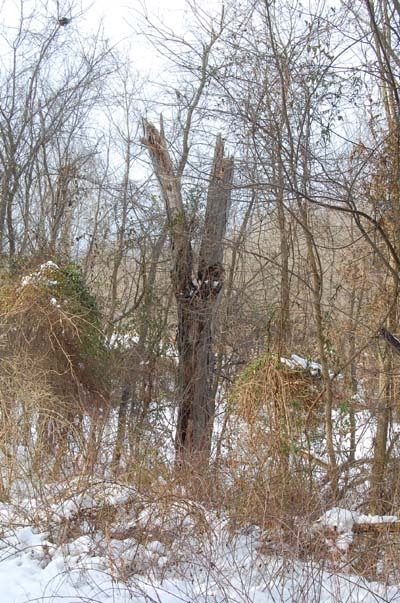 A snag, since it is already dead and decaying, will not be a permanent addition to your yard. It will likely last from 4 to 10 years, and, will have to be periodically replaced. A very easy way to install a snag is simply to set it in place and wire it to a post. Thus, the only preliminary work involved is to set a single post. The post will be a permanent addition to your yard and should be a locust or cedar fence post at least 7' long. It should be sunk in the ground 2½' to 3', depending on your soil, or, even better, sunk in concrete. This post will outlast many snags, so, in loose soil, it is well worth a bag of cement. Before placing your snag, make sure its base is cut square so the snag will stand erect. 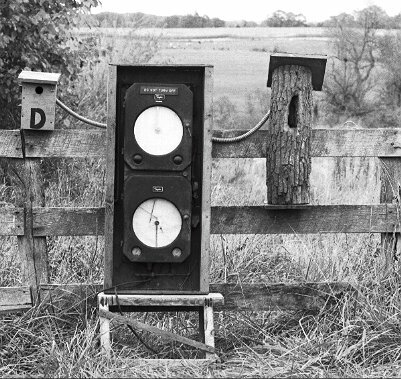 Ideally, the snag should stand on its own without exerting any pull or push on the post before wiring. Resting the snag on cement blocks rather than directly on the ground may greatly lengthen its life. Also, tacking a roof board on any upward facing cavities at the top will prevent rain water from entering the decayed center of the log. If the post is set when you bring your snag home, the snag can be lowered into position from the truck bed, making it much easier to lift the top than if it were laying flat on the ground. Heavy snags must be handled with care, since they can break or twist suddenly under the stress of being lifted on end. The safest method for handling heavy snags is to find a friend with a front end loader. Once in position, the only maintenance your snag should require is occasional tightening or replacing of the rusting wire. If you use a short piece of cable instead of wire, you will have zero maintenance. Our yard snag is a seven foot section of shagbark hickory wired to a salvaged 4x4 post. 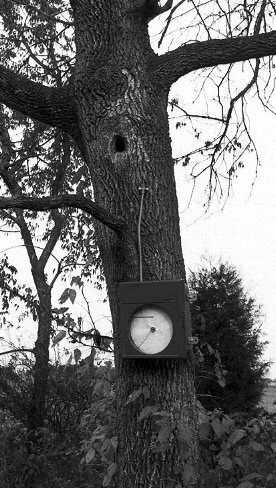 It was put in place in the fall of 1992 as an addition to one of our feeding areas. Many 1" holes were drilled to serve as suet and peanut butter feeders. These eventually began to attract starlings and were discontinued in favor of conventional suet feeder designs to discourage starlings. 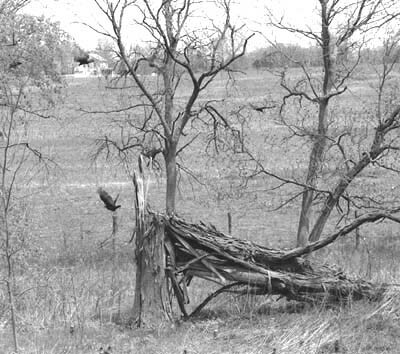 In early spring, the feeders were moved well away from the snag in order to reduce traffic in its vicinity. 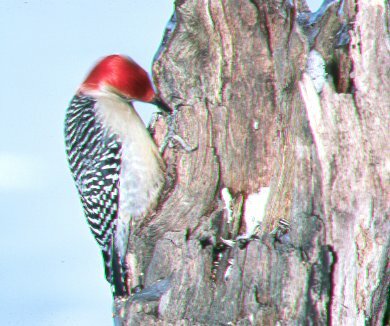 To our great pleasure, a pair of red-bellied woodpeckers began to frequent the snag and eventually excavate a nesting cavity. 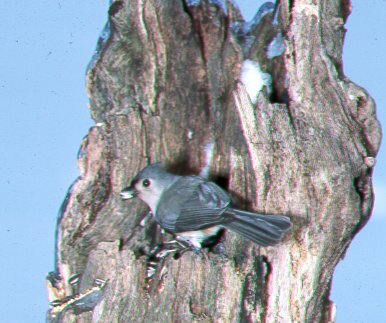 Oddly, the female did most, if not all, of the excavating, but, the male frequently visited, and even entered the cavity when it was large enough. 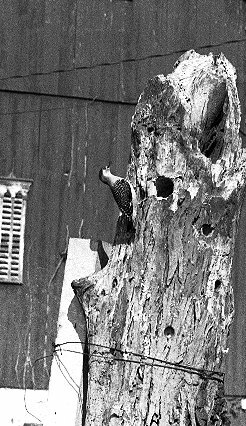 However, the woodpeckers suddenly ceased to visit the snag, and, subsequently, were found to be nesting 400' away in a tall snag. 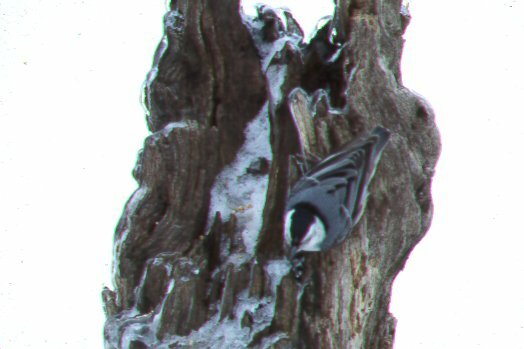 Perhaps the male was excavating his own hole while the female was busy at the yard snag. 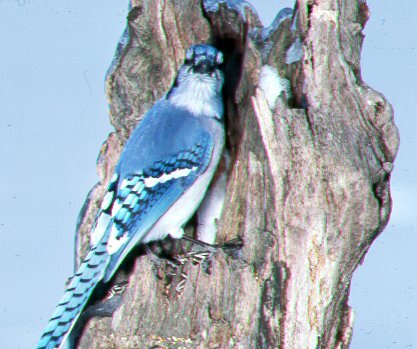 Woodpeckers frequently make several excavations before choosing one for their nest, a habit that should be greatly appreciated by secondary cavity nesters. In early May, when the woodpeckers lost interest in the snag, a few starlings began to inspect their not quite completed cavity with the idea of nesting. All of the interested starlings were either discouraged or shot, and, by late May, showed no further interest in nesting there. In late June, a pair of bluebirds moved into the woodpecker hole, laid three eggs, and successfully fledged all three. The great mass of the snag, no doubt, provided good insulation from the hot July sun. However, an early spring nesting would have put them at the mercy of the starlings. 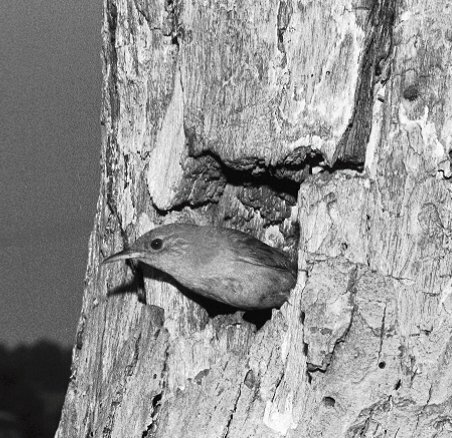 An easy option for protecting a bluebird nest in a woodpecker cavity from starlings is to fit a temporary 1½" entrance hole. A piece of leather belting is ideal for this purpose since it will curve to the surface of the trunk. Old yard snags, too rotten to safely house nests or even support their own weight are still useful in the home habitat. When such a snag is retired, it should be placed on its side in a location where you won't need to disturb it. Along with a variety of interesting fungi, the red backed salamander, a terrestrial species, is dependent upon fallen wood and decaying leaves during its entire life cycle. Another use for the decaying wood of retired snags is to provide inserts for flicker boxes. Our flickers rush to nestboxes almost as quickly as bluebirds, if they are stuffed with something to excavate. 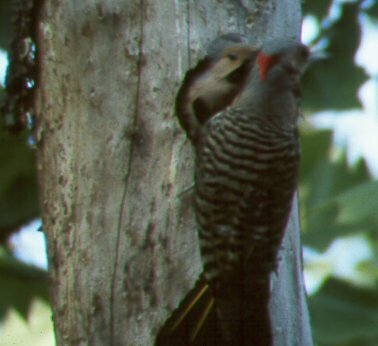 The problem is that starlings can pull out the recommended wood chips as quickly as flickers. However a block of well softened wood sawed from a snag will still attract woodpeckers but starlings cannot use it. My first inserts turned out to be too solid in the center, and the flickers gave up. However, a second try was successful. It is a good idea to cut several blocks for future years and drill into the center to check the degree of rot. Also, there is no need to use a single solid block. several slabs cut to the size of the inside of the nestbox can be left in a damp area to further rot before use and then stacked in the nestbox. Thoroughly dry the inserts before placing them in the box. The ultimate backyard deadwood project would be the snag orchard - a cluster of a dozen or so 7' snags. Its value to wildlife may be debatable, but, it would certainly make a dramatic photo and an emphatic statement. Cleaning up after nature has become an American obsession which is definitely of no value to wildlife. A natural snag by the creek. Temperature was being monitored in the red bellied woodpecker cavity. leather belting used to reduce the entrance hole size in a log box The natural elongated hole is shown in the above photo. &COPY; 1994 - 2014, American Artifacts and Richard Van Vleck, Taneytown, Maryland.